When it comes to updating a kitchen, painting the cabinets is one of the BEST bang-for-buck ideas out there. But, unless you have pro-skills and the patience of a saint, it ain’t for the faint of heart. 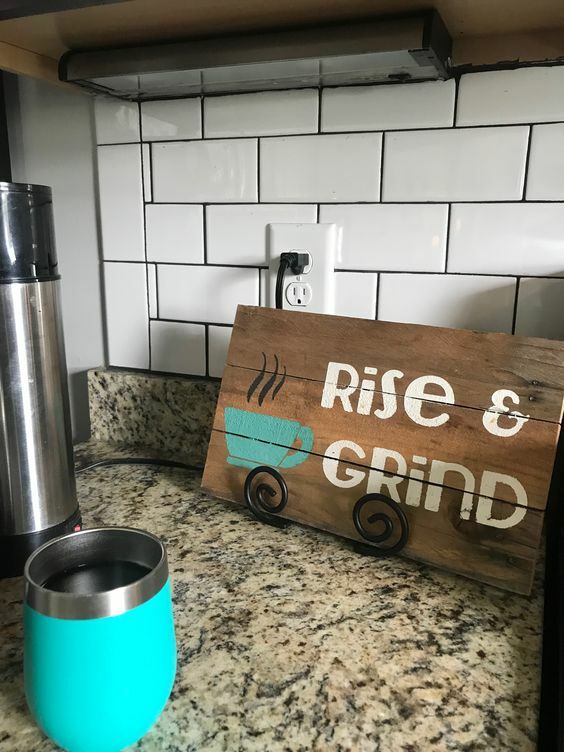 So, I’m going to share some tips and tricks for getting it right the first time, as not only have I consulted on HUNDREDS of cabinet projects via my E-Design, I’ve also painted DOZENS of pieces myself (because I am a glutton for punishment). And keep in mind, that there are SO many exceptions and other considerations (ie: flooring/exposure/style/etc…) and I can only hit SO many things on my weee lil’ blog. What I’ve tried to cover are the BASICS and some tips to get you on the right path. And if you need advice from there, I have a FAB E-design service and would be more than happy to help! And I know this is going to hurt, but guess what? Now, if you and your kitchen want the SAME thing, then hells bells, we’re on a roll! However, on a weekly basis, I find myself talking clients off the ‘white cabinet cliff‘ and into colours that are more suited to their kitchen and it’s specific needs. Your kitchen needs to be able to visually support the colour of the cabinets – and not every kitchen can support bright white, gray or whatever cabinet colour is on-trend. In fact, more often than not, I’ve discovered that kitchens prefer a soft white, off-white or even cream. But, how do you figure out what the right colour is? Did you know that the FINISH of your paint will affect the way it looks? That’s right. So, if you make a cabinet paint sample in an eggshell finish (typical wall finish) and love it, that doesn’t mean you’ll love it in a satin finish, which is a more common finish for cabinets. The higher the sheen, the more light it will reflect. This reflected light can make a paint colour look a bit lighter and brighter than you’d expect it to (compared to matte/eggshell finish). You might even find that the wee paint chip that SEEMED a wink too dark for your cabinets, actually looks PERFECT when you sample it in the right paint finish because it looks a bit lighter. You can also order paper paint samples (some stores have them in-stock) and these can work pretty well as they tend to have a slightly higher sheen. Just do what my client did (above) and tape them to something white so you can see the depth/contrast. You need to figure out whether your backsplash and countertops are in a warm family or a cool family (and they should be in the same family). And this applies to white backsplashes, multi-coloured ones and even metal ones! And when it comes down to it – SAMPLE SAMPLE SAMPLE until you hit the right spot (it’s my motto with wine and men as well – just joking on one of those Tim). 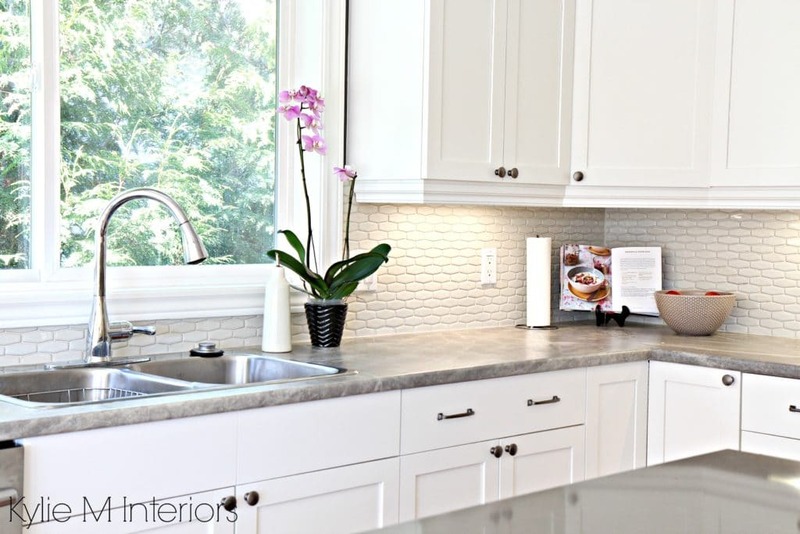 Most people refer to their countertop when choosing a cabinet colour and sure, it’s VITALLY important, however, the backsplash is MORE important. Why? Well, the backsplash and cabinets are on the same vertical plane, which means they are initially more visually connected to each other and pass through your vision at the same time. Let’s hit that one…more…time. 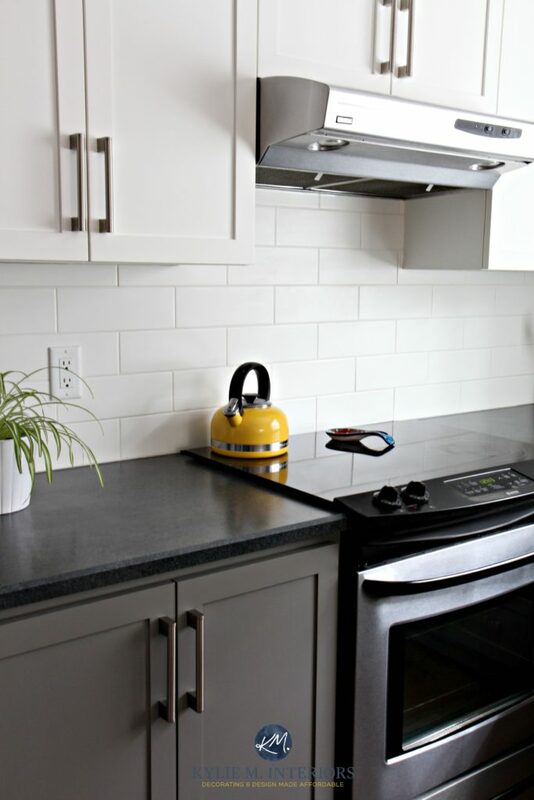 The backsplash and cabinets are on the same vertical plane, which means that they are more visually connected to each other than the cabinets and countertops. This means that because your countertop is horizontal, it actually plays second fiddle to your backsplash when you’re choosing a cabinet colour. 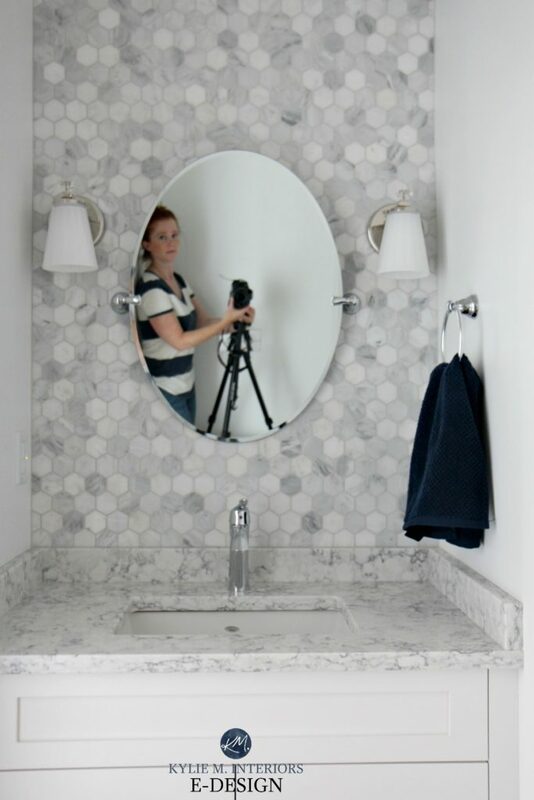 Now, if you don’t have a backsplash, that’s a whole different project and you can just move on to Tip 4, but for the rest of you, let’s take a closer look at things. If you are wanting white cabinets, your backsplash and your cabinets have to be the SAME WHITE. And yes, it can be a painful process trying to figure out which white is your white (I prefer Pinot Gris myself), but if you get it WRONG you’ll have a WAY bigger problem. If you’re wanting coloured or darker neutral cabinets, you need to coordinate colour families. If your backsplash is a crisp clean white, your cabinets will prefer a cooler colour/neutral. If your backsplash is slightly warm/cream, your cabinets will prefer warmer colours/neutrals. And what happens if you miss the colour boat? Well, for example, if your backsplash is a soft, slightly warm white and you choose a clean, crisp white for your cabinets, your backsplash could look yellowish in comparison. If your backsplash is pretty damn white and you choose a soft, warm white for the cabinets, your cabinets will look dingy and yellowed in comparison. Of course there’s a WIDE range of cabinet colours out there, however, most of my clients are looking for some form of neutral. What you want to do is find the NEUTRAL that is in your backsplash and pick that up on the cabinets. And keep in mind that there are ALWAYS EXCEPTIONS, it would be virtually impossible for me to cover EVERY scenario (I’m good, but not THAT good). What I try to do is hit the most common colour conundrums. Once you’ve narrowed down the colour candidates based on the backsplash, you can look at your countertop to make sure everything still jibes. 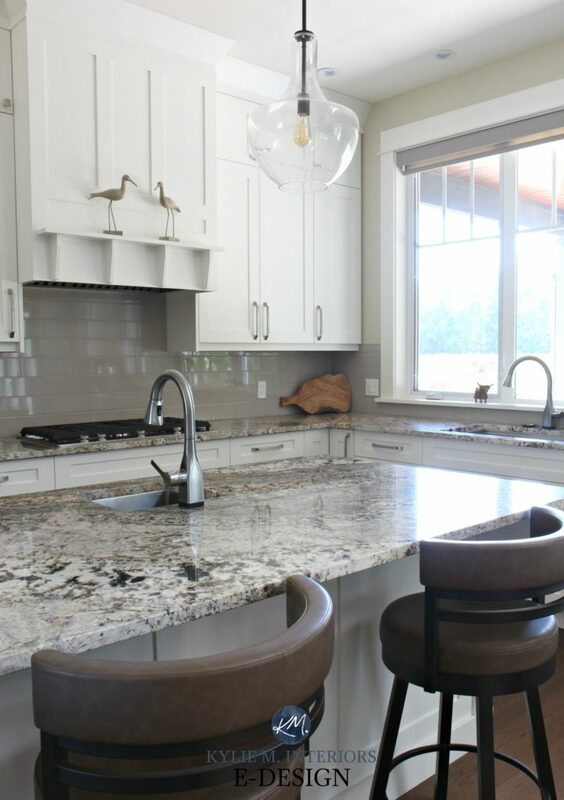 If your countertop and backsplash don’t look good TOGETHER, you MIGHT want to check out Tip #6. On the other hand, if you don’t HAVE a backsplash, this would be the first place to start! Often, the countertop is actually the DIRECT inspiration for the secondary cabinet colour (ie: lower cabinets or island). This is where you’d find a light/medium/dark colour that is living in your countertop and apply it to the cabinets as a complement to the main cabinet colour (which is usually white or a soft neutral). In this case, the countertop plays a BIGGER part than the backsplash. REMEMBER, there are ALWAYS exceptions, I’m just here to cover the most common queries. Why do I keep saying that? Because I just KNOW that my comment section will get flooded with these exceptions/questions otherwise. And for MOST of these exceptions, I do need to refer to my E-design as photos will show me what’s going on in your room and the questionnaire will help me to figure out what you’re HOPING you can do! Tip 6 What do I do if my backsplash and countertop DON’T look good together? You’d be amazed at how often I come across this – a backsplash that has been poorly chosen/matched to a countertop. And it ALLLL comes down to Tip #2 and #3. So, if your cabinets/countertop aren’t a hot combo, you will want to favour your backsplash because the backsplash/cabinets are in the SAME eyeball and it’s more important that THEY coordinate (that being said, if things are lookin’ real fugly, a backsplash is WAY cheaper to replace than a countertop – just sayin’). The above photo was a tricky one, but a great example for you to check out. You can see how the white of the subway tile is TOO white/stark for the warmth of the granite. And while my client wanted white cabinets, I recommended that she actually went into warm gray cabinets, hitting up those flecks in the countertop as a way of creating a ‘happy medium’ between the warm and cool colours in her products. If she STILL wanted white cabinets after our little discussion, she would have to choose the best white for the BACKSPLASH, not the countertop (and those are WAAAY different looking whites…and it would’ve been terrible). Benjamin Moore Advance in pearl finish. And no, I don’t get paid to say that, I pay myself in wine and personal high-fives – that’s it. Seriously though, this is a GLORIOUS paint and gives a close to factory finish look (not including your painting skills, which I can’t account for). I tried the semi-gloss one time, just to SEE what it was like and if you like surfaces that you can see your own reflection in, then you’re golden. I also like Sherwin Williams Emerald Urethane. And because it says ‘urethane’ a lot of people seem to think it’s an oil paint, but it’s water-based and anyways, NOBODY uses oil anymore – well, except 65-year-old painters, they love that stuff. I find the sheen of the Emerald Urethane to be JUST slightly lower than BM Advance, which is why I lean toward BM. I’ve heard of a few complaints re: SW All Surface Enamel being a bit gummy, so I’ve stayed away from that one. And these paints aren’t CHEAP my friend, but if you’re looking to save money – you should look elsewhere as when it comes to cabinets, you need it done right the FIRST time. GOOD prep, GOOD primer and GOOD quality application products (oh, and good advice helps too – wink wink). 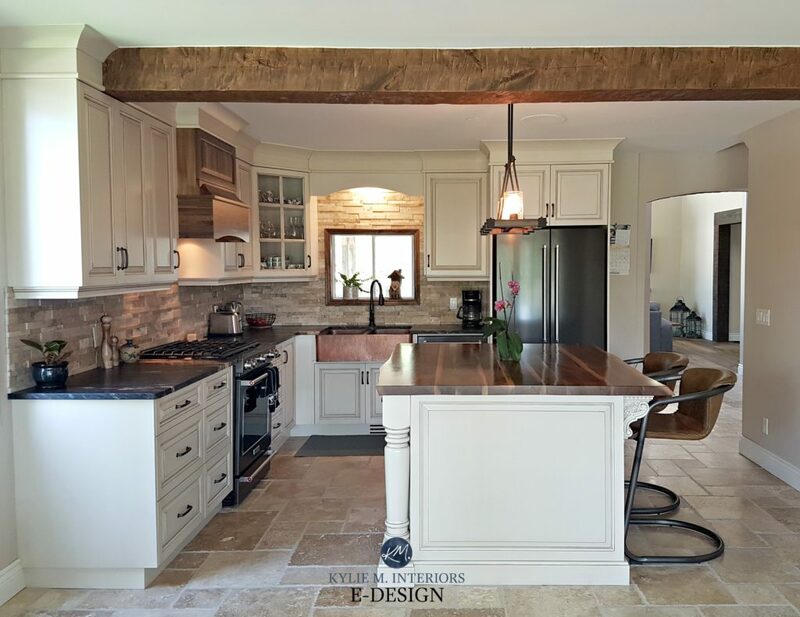 Check out my E-design services where I can VIRTUALLY visit your home! I have painted BM linen white cabinets that I would like to paint a brighter white. They are chipping a little now. Is it possible to paint them myself or do I need to hire someone to paint them? thanks! 2. What type of cabinets you have. If they are smoother, ie: maple, it can be trickier to do a good DIY as it’s MUCH easier to see the flaws vs a grainy wood like oak. If you feel TOTALLY confident in your prep/painting skills and commit to what is a pretty major project, then yes. Otherwise, I’d hire out. It’s such a major part and if it isn’t done right it will cost more to fix them! Hi Diane, I would DEFINITELY start with the countertop first! Take your cabinet paint sample with you (or a drawer front) a sample of your flooring (or atleast a good photo of it 🙂 Once you’ve got your countertop picked you can coordinate the backsplash in! Was supposed to be taupe black white gray… so picking a backsplash .. the architectural gray seems to go with counter tops, but it also enhances the green undertones. I am panicking… building a house, for excto make a quick decision… help! Useful practical information with photos to demonstrate your specific points is well appreciated! I have a 10 year old builder kitchen with warm busy counters and builder cool white cabinets. I have hesitated replacing the conflicting backsplash as it won’t completely solve the problem, but it will slightly improve the situation. Your point of keeping the elements in the same visual plane cohesive makes sense and I appreciate the way you explained it. Thanks! 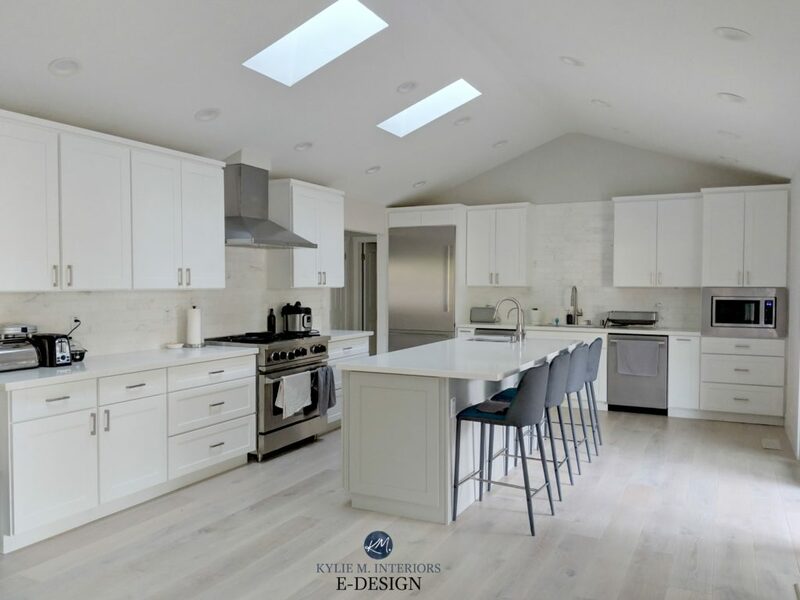 We have picked a white quartz with grey veins and decided to go with glossy white subway tiles, Benjamin Moore eagle rock cupboards and drawers. This is for our basement… what do you think? Hi Maha! EAgle Rock is beautiful. It’s a solid medium toned warm gray, so it has brown and purple in it. Now I can’t tell you it will suit your quartz as gray will have undertones of either blue, green, purple or a mix of those, so it will depend on what your quartz has! 🙂 I can say that a slightly safer bet would be SW Dovetail. I recently painted my sunroom/living room SW Canvas Tan 50%. That room connects to our kitchen through a pennisula. I am wondering what shade of white I should paint the pennisula, and all of the cabinets. I am imagining something warm, but not yellow. I like the crisp clean look of white, but not stark white. Also wondering what shade of gray for our new quartz countertops that I want to purchase. Thoughts? Thanks! Hi Heidi! You will definitely want to choose your countertop before the cabinet colour as the countertop will TOTALLY dictate your white options! That being said, Canvas Tan isn’t a colour that I’d normally put with a gray quartz, but that being said, I haven’t seen it 50% lighter and there are some gray quartz countertops that could humour a warmer wall colour like Canvas Tan. In the VERY near future I will be offering ‘countertop selection’ on my site, but it’s just not quite ready to launch yet!